Gift cards are such a common gift these days, however, it's nice to dress them up a little by presenting them in cute packaging instead of the run of the mill pockets they come in. Last month at stamp club we created this cute little gift card holder from a paper back. 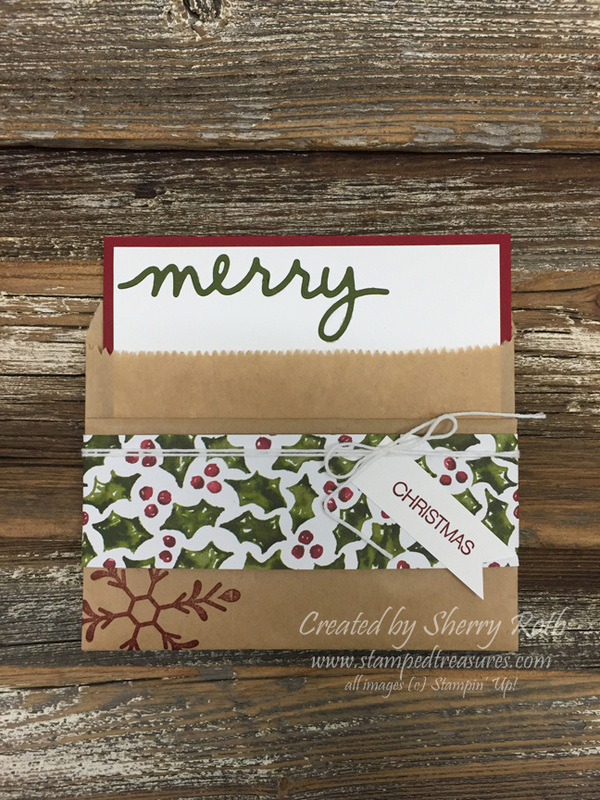 The pocket for the gift card is at the front and then the card to be used for the message tucks in the back pocket. I was inspired by a swap I received from Patty Bennett at Founders Circle. Score the bag at 4" from the top and fold the bottom up. Wrap a 1-1/2" x 10" piece of dsp around adhere to the bag. Note: I didn't use any adhesive to hold the bottom flap up - the dsp will hold it in place so that it creates a pocket for your gift card. Insert measures approximately 4-1/4" x 4-3/4" for the mat and 4" x 4-1/2" for the white. The Stampin' Up! bags are slightly smaller than the ones I used so if you are trying to recreate this exact project, just know that it will look slightly different because of the size of the bags.